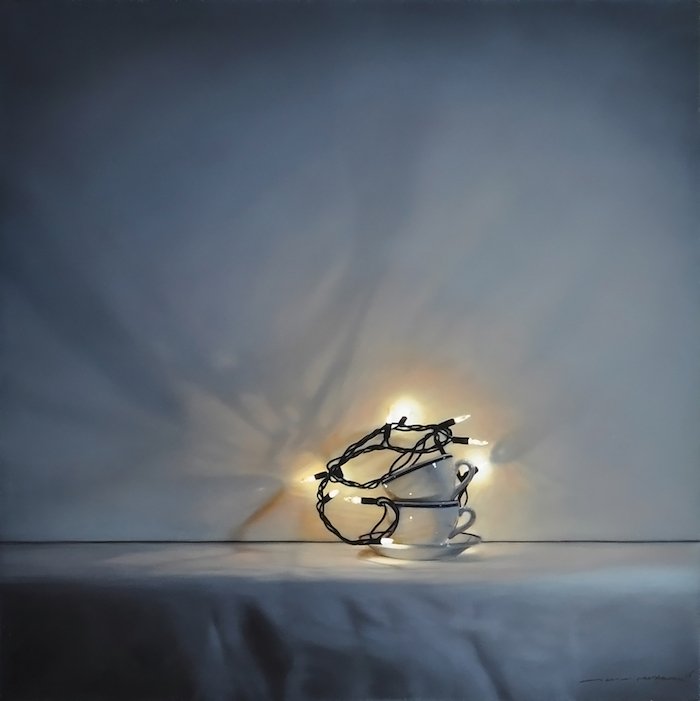 Tom Betts has an early history in academic painting, which is characteristic of artists at Dawson Cole. The gallery also represents Wayne Thiebaud, California’s favorite painter, and Jian Wang, who studied under Thiebaud at UC Davis. Tom Betts, Jian Wang, and several others from the gallery have taught at Laguna College of Art and Design, very near Laguna Art Museum, which is the museum of California art. Betts is a well-known California artist, but his works are motivated by research beyond the figurative and plein air paintings associated with the region. 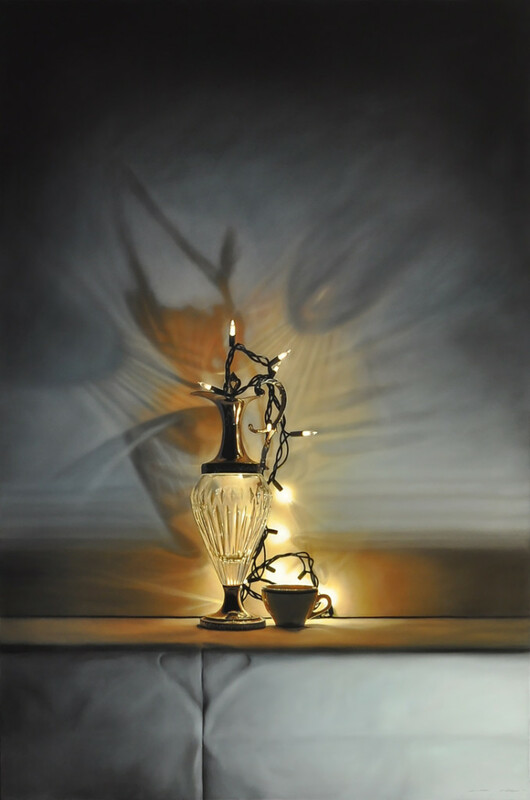 His incredibly detailed still life paintings, with characteristic string lights, create effects with light and shadow that surpass photorealism and could be described, instead, as magic realism. In each of his series, Betts uses aesthetics to explicate temporal states and identities. In earlier works, jars of fruit and delicate china cups represent tradition, history, and preservation. 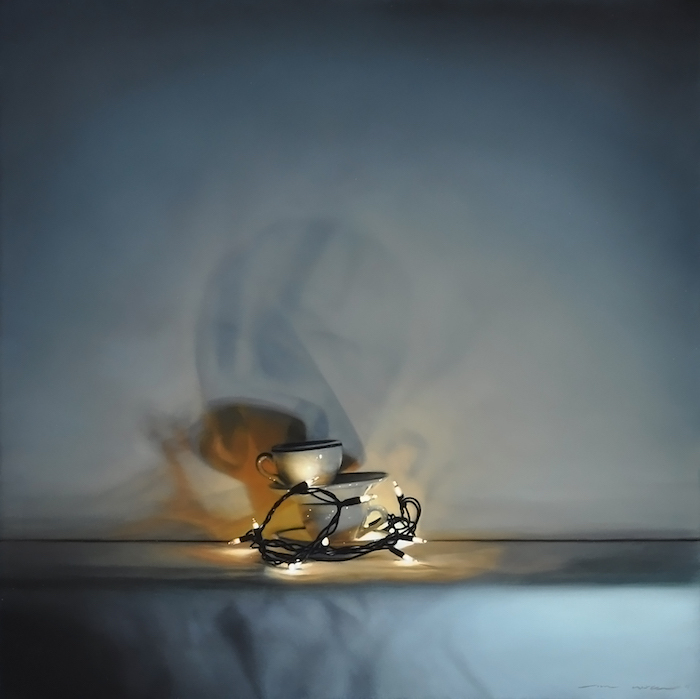 Flowers in one series and food in another show growth and decay, and cups appear as both literal and figurative vessels with capacity for identity. The warm glow of string lights literally sheds light on what is ephemeral. 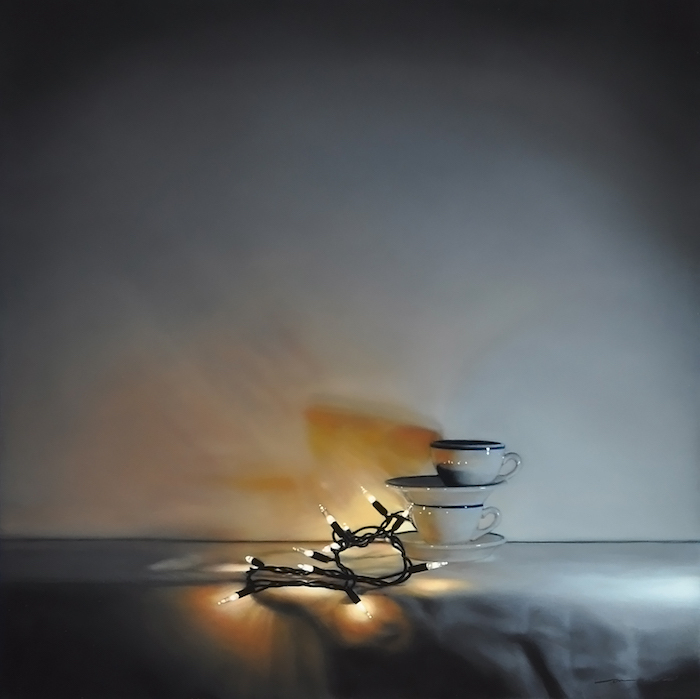 Betts’ objects and aesthetics transition through these narratives, encapsulating distinct tableaus within each series. 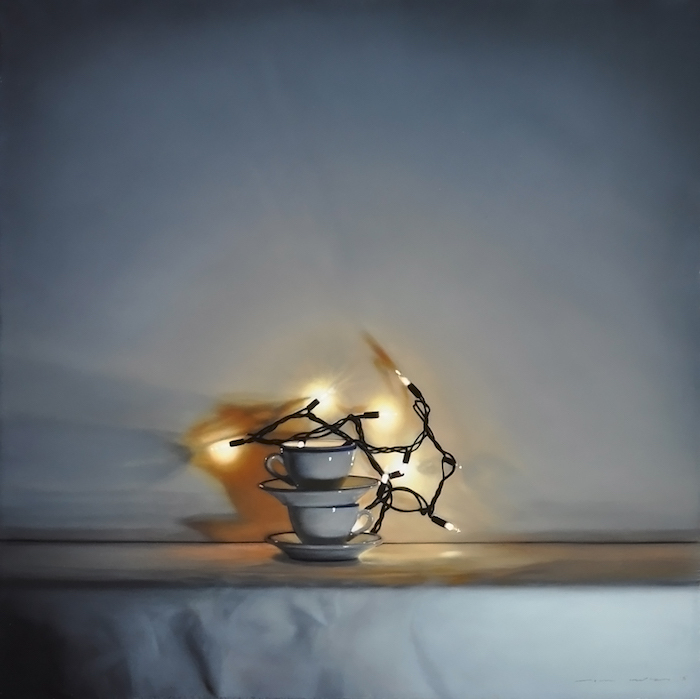 In Fire Light, Betts pairs string lights and cups to create effects that are more profound than cast shadows. The works are smaller than scale, which invites close viewing. The cups affect their own silhouettes to expand a feeling of “mono no aware,” which describes a sensitivity to the transience of things. Google that term, then study these paintings. Tom Betts achieves unmatched realism with incredibly refined surfaces. 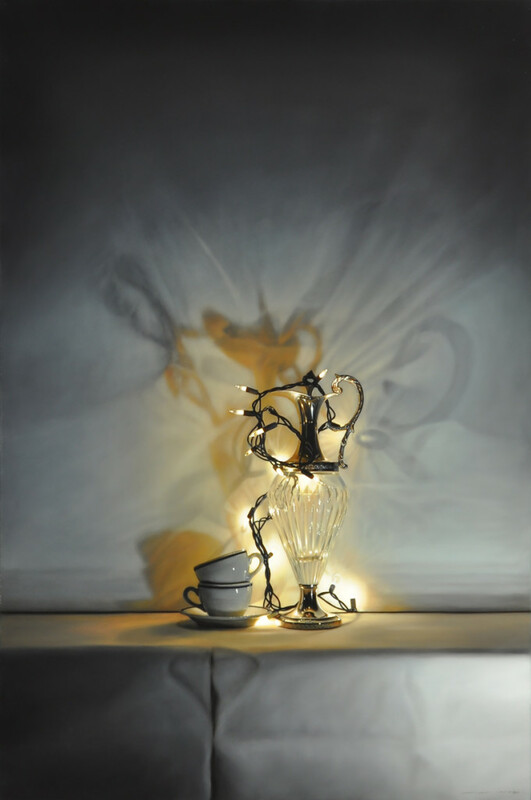 Within those aesthetics are expertly balanced sentiments of magic realism where objects are beautifully real and the artist’s research of identity is carefully illuminated. Works from Fire Light and other series by Tom Betts are represented by Dawson Cole Fine Art in Southern California and by Thomas Anthony Gallery in Park City. See more at tombetts.com.